1. Must be children, grandchildren, or great-grandchildren of American Legionnaires in good standing of two or more consecutive years membership. Operation Enduring Freedom and Operation Iraqi Freedom Era veterans are exempt from the two-year membership requirement. Children, grandchildren, and great-grandchildren of deceased Legionnaires are also eligible. 2. 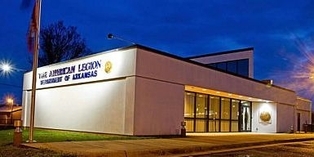 Applicant or eligible Legionnaire must be a resident of Arkansas. 3. Must have received a high school diploma or the equivalent by the time this scholarship will be awarded or be a graduate of a two-year college from an Arkansas Institution. 4. The Scholarship Application (see attached) must be submitted by the student and endorsed by his or her parent or legal guardian. 5. Applicants must provide: One character reference in business letter format from an official of the student’s school, one letter of endorsement from an American Legion officer (local preferred), and one from an unrelated person belonging to none of the above. 6. A certified copy of the student’s transcript. 7. A declaration of support for the Preamble to the Constitution of The American Legion, as printed on the application. 8. A Drug-Free Pledge is required as printed on the application. 9. One photograph (approx 3x5) and written authorization to use it. The photograph will be used for press releases. 10. On a separate sheet of paper, using an essay format, provide a brief autobiography, career goals, and why you are the most qualified to receive this scholarship. The $1,000.00 Coudret Trust Scholarship is available to students who choose to attend an Arkansas or out of state institution of higher learning. The $2,500.00 Garner Trust Scholarship is available to students that will attend an Arkansas college, university, or technical/trade school. It will not be transferable to an out of state institution of higher learning. Both scholarships are a one-time award and are not renewable. Students may apply for either or both of scholarships; however, only one scholarship will be awarded per applicant. Department Headquarters on or before March 12, 2019.